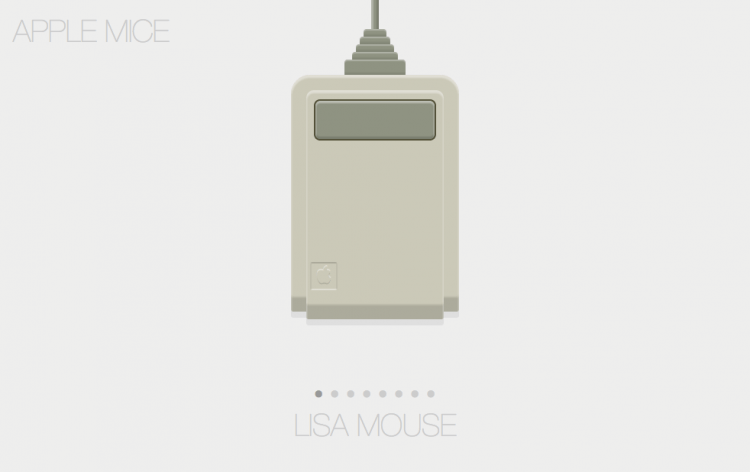 Josh Bader has created a mini site that documents the history of the Apple mouse in a slick visual presentation. While we have seen many projects like this over the years, Apple regularly being the topic of choice, Bader's site is more than just another one of those. Bader's site shows each iteration of Apple mouse, of which there aren't very many, starting from the Lisa and Macintosh era versions all the way through to the iMac Mouse, Pro Mouse and the current generation Magic Mouse. While accurate and interesting, a task like this really isn't all that impressive until you realize all of the artwork was created with nothing more than HTML and CSS. There is absolutely no traditional artwork involved here, no vector drawings, jpgs, gifs or pngs, just some incredibly detailed and impressive coding. A task like this requires an extreme amount of time and skill, along with what would have to be a deep dedication to the craft, even the transitions between each mouse is nicely done. Head over to Josh Bader's Codepen page to scroll through the history of the Apple mouse in pure CSS for yourself. You can check out Web Designer Depot for more of a technical break-down on Bader's work.